Three presidents met on the stage in The Carter Center's Cecil B. Day Chapel last Wednesday: former US President Jimmy Carter, former Emory President James T. Laney, and current Emory President James W. Wagner. Hosted by the Emory Alumni Association, the event, "Presidents in Conversation: Legacies of Leadership," would have been a historic and noteworthy occasion even without the coincidence of three such prominent figures sharing the same first name. True to its own title, the program was not a formal presentation, but a conversation — one guided by shared history, dedication to Emory, genuine affinity for one another, and plenty of humor. Prompted by moderator Crystal Edmonson 95C of the Atlanta Business Chronicle, Carter and Laney effortlessly cast back more than three decades to Carter's early relationship with Emory, which began when he first visited the campus in 1979 for the groundbreaking of Cannon Chapel. Laney remembered how thrilling it was to have the U.S. president visit the University; Carter remembered that the day was sweltering hot and he had been obliged to wear heavy robes. But the academic regalia must have fit. In 1982, Carter was appointed Presidential Distinguished Professor and took up residence in an office on the 10th floor of the Woodruff Library, The Carter Center's first home. "When President Carter was appointed to the Emory faculty, he said, 'Does this carry tenure?'" Laney said. "I said, well, to get tenure you have to write a couple of books. Since then he's written about two dozen books—"
"And I still don't have tenure," Carter returned, with characteristic quick wit. During Carter's early years at Emory, Laney also recalled standing on the Quadrangle with Karl Deutsch, an internationally known political scientist who became associated with Emory and The Carter Center after retiring from Harvard. Flanked by his Secret Service officers, Carter walked by on his way to his office in the library — "Just a normal scene at Emory," Laney quipped. According to Laney, Deutsch stopped Carter and told him that he will be remembered a thousand years from now for being "the first world leader to link human rights with foreign policy." It was a moment, Laney added, that he never forgot. Carter credited Laney with inspiring the Atlanta Project, started by The Carter Center in 1991 to address resource gaps in the city's urban communities. "I had come back from overseas," Carter recalled, "and I had been gone a long time. President Laney said, 'You are doing a lot overseas; why can't you do something at home?'" "I don't think I put it exactly like that," Laney interjected. Regardless, Carter turned his attention to the Atlanta Project, which worked for positive change in the areas of education, housing, economic development, health and criminal justice. Wagner described the profound impression made on him when he met both Carter and Laney before his official arrival at Emory. A few years later, he noted, he and his wife, Debbie, traveled to Africa with the Carters to better understand The Carter Center's work. "I think part of The Carter Center's success has been its focus," Wagner said. "It is interested in making a difference, not just making a statement." 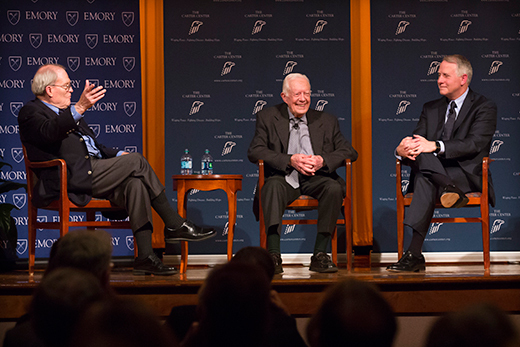 All three presidents touched on the many ties between the two institutions — from the numerous faculty and alumni who have had dual involvement, to the monthly breakfasts shared by the Carters and Emory's president, to Carter's regular appearances in University classrooms and at the annual freshman Town Hall, where he fields questions from students. He approaches that event "with some trepidation," Carter said drily, "but I survive pretty much." The connection between the University and The Carter Center is both far-reaching and firmly established, all agreed. "The relationship is permanent and it's virtually indestructible," Carter said. "I have personally gotten more out of this partnership than Emory has. It has made the time since my presidency the best time of my life." "I don't know what Emory University would be without you two," added Wagner. "It would not have the ethos that it has, it would not have the same drive as a global citizen. Please allow me to thank you both."